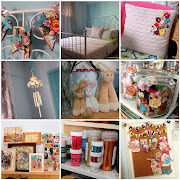 One of my besties, Ling wanted to decorate her kids' room and requested that I make some stuff for the room. I of course said yes! Who would say no to these adorable kids. Kyan and Charlotte, these are especially dedicated to you from Aunty Lia! I also did this set of mini frames for these cuties. Doesn't Kyan look so cute in those glasses!